We have noted that Ganesha is also known as Vinayaka which means that he is considered as the lord of the Holy Breath of life and that this Holy Breath of life is different from the air of the atmosphere. We have also noted that medulla oblongata situated above the throat region controls the breathing process which is the first among the bodily functions of Prana and that this organ can be identified as the Muladharam. 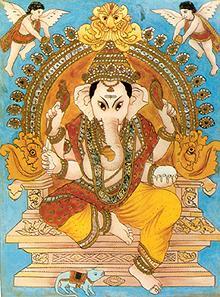 Ganesha being the presiding Deity of this psychic centre, he should be considered as the personification of the psychic forces within us whiches could be evoked for spiritual elevation. We have also noted that the practice of yoga is the best method to stimulate the psychic centres. But this method requires great mental discipline and rectitude. In fact only very few people follow this method in the honest way. In the practice of religion most people follow the path of ritualism. For people who have adopted the ethics of yama and niyama, ritualism may be a slow acting method of stimulating the psychic centres. Ritualism done with personal devotion is an appeal to the psyche in the individual. When demonstrated in a festive manner with a group appeal it becomes a festival. The several devotees, who whether with devotion or without devotion participate in the festival and even onlookers are caught in the elation and joy of the occasion. In festival, the appeal is to the psyche in the mass. But in any case ritualism bereft of the ethics of yama and niyama will not bring about any spiritual advancement.